There is nothing more relaxing than sitting with my "darling" each night stitching away. I have a little basket which sits beside me and always has stitcheries waiting to be stitched. Here is my "Spring Garden" stitchering featuring Chester which is all finished. I now have to decide what I am going to make it into - I am thinking a cushion would be nice - What do you think? In my basket are the lovely stitcheries that my friend Vicki recently designed. They are a lovely flowing stitchery and look great done in variegated threads. When I stitch I always seem to bend my needles - This is just one out of my pin cushion. I think that it is my binding needle but is now just so comfortable that I don't have the heart to throw it out. Do you bend your needles when you stitch? I also wanted to ask what sort of lighting you use of a night to stitch. I am looking for a new light. I like the sounds of this one - Does anyone out there have one of these? I am starting to have trouble with my eyes so I think that I need the magnifier. You do beautiful work I so enjoy stopping by your blog . I bend my needles when I hand quilt but not when I do embroidery . For night stitching, I took the advice of the 'lighting shop' staff. My standard lamp now has a 'fancy' light bulb - wonderful. That is so pretty - I love it and I think it would make an outstanding cushion! I only bend my quilting needles. I use very tiny, short and thin needles for hand-quilting, and they don't last long, lol. Your stitchery is just gorgeous, Love Chester, a cushion would be perfect. I am a needle bender, but I must be harder on mine as I tend to break them about the same time they get to the right angle. I have one of those lamps and just love it. I do have the magnifying attachmen but I don't use it. I find that the light is enough to see what I am doing. Hi gawjus Fee.... Yes, I'm a needle bender too he he he. I just love your Spring Garden stitchery!! A cushion ... or even a wallhanging ... would be beautiful!!! Love Vikki's flowers in the variegated thread too ... they look so pretty!! My eyes are playing up too...just got glasses a few months ago(hate, hate, hate....means I'm getting older and I don't need to be reminded! )and looks like they may need checking again....can't focus on the stitches clearly..... gggrrrrrrhhhhh!! I've looked at that lamp too...thought about subscribing to some mags to get a 'free' one! I'll keep watching your blog to see what others think too!! Love your Spring Garden. A cushion would be a nice use for it. I too only bend needles when quilting, not when I am embroidering. I am also finding lighting difficult in the evenings so I look forward to what others have to say. Spring Garden is just lovely Fiona...so happy with a soft look. Would look nice as a wall hanging with some delicious patchwork fabric around the edges. I also bend needles....usually have to start off with a new one for each project. My favourite stitchery needle is an Embroidery Size 9. 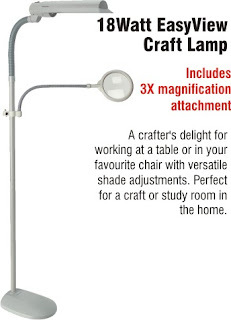 I have just purchased the Daylight Portable Lamp to stitch under at night and it is fabulous. I don't know how I managed without it. I don't bend my needles with stitcheries......I save that for my sewing machine !! A good light makes all the difference in the world. Yes i also bend my needles, interesting. Mind you I still use them and keep them as my stitchery needles. Another problem I have is cutting Binding, I offen get a wave in the biding where the material folds in the middle. I guess I will just have to fold it out and cut it without the fold. Interesting problem we have to deal with. Love your stitcheries. A cushion would look lovely. The stitcheries are lovely! And yes, my needles bend too! It doesn't happen with stitcheries, but it does with appliqué and sewing. Your stitching is so pretty and I have never seen anyone bend a needle like that doing hand sewing. Now hand quilting is a different story - mine have to get bent before I am comfortable stitching with them. I have not used this light, but it sure looks like a good one. I love your spring garden, and as to lighting, I use a daylight lamp, which is so good! The Show Starts Tomorrow !!! Have You Seen My Mojo?